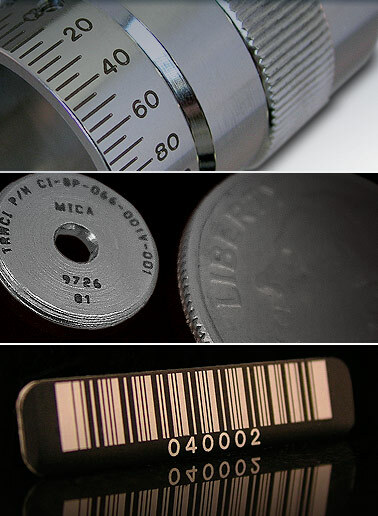 Industrial laser marking is the favored marking method when permanency or aesthetics are desired. Industrial marking is also favored when the part to be marked is too small or has too complex a shape to be marked with anything but industrial laser marking or etching. The image above shows a clock face and drum dials along with a bar code tag. Our lasers mark dozens of different bar codes as well as 2D matrix codes for tracking products in a production environment or for identifying electronic components by batch or series. Shown at left are a variety of components and instrument tags that were deeply marked, using industrial laser marking or etching, to withstand long term exposure to the elements. Find out how Laser Impressions can help your business through industrial marking. Call one of our industrial marking specialists at +1 (800) 344-5273.